After last vintage’s second-earliest start on record on November 12, 2014, winemakers and viticulturists in BC are collectively rejoicing at the early arrival of freezing temperatures this week with the first day of Icewine harvest in the Okanagan starting on Wednesday, November 25 and continuing into the early morning hours on November 26. Harvested at minus 8°Celsius or below, the wine made from these frozen grapes must reach quality standards including 35 brix of sugar to be called true Icewine. This year, 20 wineries expressed interest in producing Icewine for a potential harvest of 722 tons from approximately 169 acres, last year there was a total of 844 tons picked. The first 2015 Icewine grapes were brought in by Volcanic Hills Estate Winery in West Kelowna on Wednesday, November 25 just after 6 AM with temperatures at -13°C (8.6°F), bringing in four tons of Chardonnay and four tons of Pinot Noir. President Bobby Gidda reports that the overall quality is very good with very sweet characters, noting they got over 40 brix in their Chardonnay. “Being such a hot year, I thought a lot of the crop would’ve fallen off, but the large clusters of grapes were all hanging in there and I’m seeing nice sugars in the fruit. I think it’s going to be a very good vintage for Icewine,” says Gidda. Summerhill Pyramid Winery in Kelowna also started their harvest Wednesday night reporting “perfect conditions for picking” in a recent interview. Winemaker Eric Von Krosigk notes that they harvested 25 tonnes with another 96 tonnes to go, and the quality is outstanding. With the arrival of the Icewine harvest, wine lovers across BC can look forward to an excellent crop of new Icewine releases in 2016. Wineries that have decided to forgo the Icewine designation have already started picking grapes for Late Harvest wines on October 1,2015 with approximately 42.5 tons picked so far and still being picked. 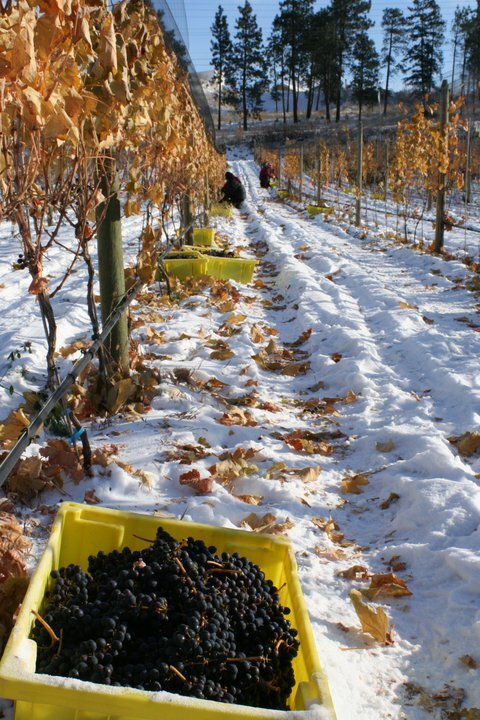 To keep up-to-date on the harvest, follow @WineBCdotcom, #BCHarvest2015 and #Icewine on Twitter.